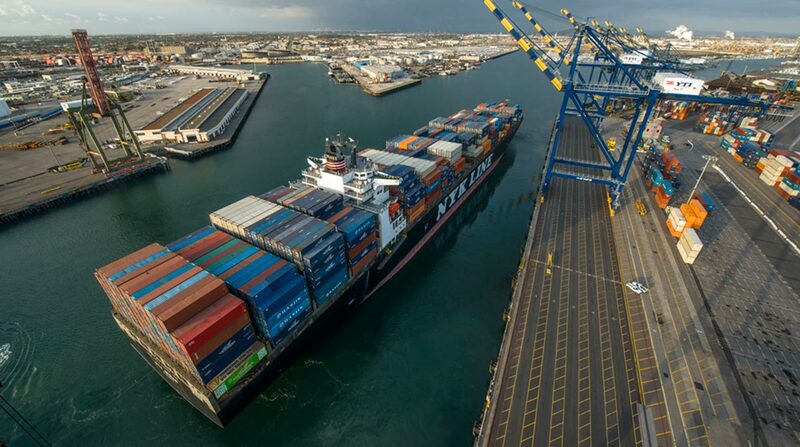 Top ports in North America are on pace to shatter all-time records on import container growth, already setting a monthly record in July, according to the latest monthly Global Port Tracker report from the National Retail Federation and Hackett Associates. In July, the latest month of data available, ports covered in the survey handled 1.78 million industry-standard 20-foot-equivant containers, or TEUs. It’s the largest single month of full containers imported into North America since NRF began tracking the data in 2000. The results were 9.2% higher year-over-year and 5% better than June. In the United States, Global Port Tracker monitors the loaded import containers at the ports in Los Angeles, Long Beach and Oakland in California, Seattle and Tacoma in Washington; New York and New Jersey, Virginia, Charleston, S.C., Savannah, Ga., Houston, and Port Everglades and Miami. Previously, Global Port Tracker forecast the record would be set at 1.75 million in August, but now the last full month of summer is expected to produce a 0.1% dip from last year yet still end with one of the five highest months on record. While hurricanes Harvey and Irma likely will produce a localized effect in Texas and Florida, the NRF and Hackett Associates don’t believe it will adversely affect the nationwide results. Harvey hit Houston and other areas in eastern Texas on Aug. 25; Irma came ashore in Florida on Sept. 10. Both were catastrophic storms ranging from Category 3 to 4. For the full year, the Global Port Tracker predicts a total of 19.7 million TEUs, 4.8% better than the record set last year of 18.8 million. Despite the record imports, Hackett Associates founder Ben Hackett cautioned about a deceleration in 2018. West Coast imports are expected to grow only 0.3 percent during the first half of 2018 over the same period in 2017, Hackett said. On the East Coast, which has been gaining market share from the West Coast, volume should grow 1 percent.